In 1857 Francis, John and Joseph Crossley — three brothers from a successful Halifax carpet-manufacturing family — decided to set up an educational college in the town. 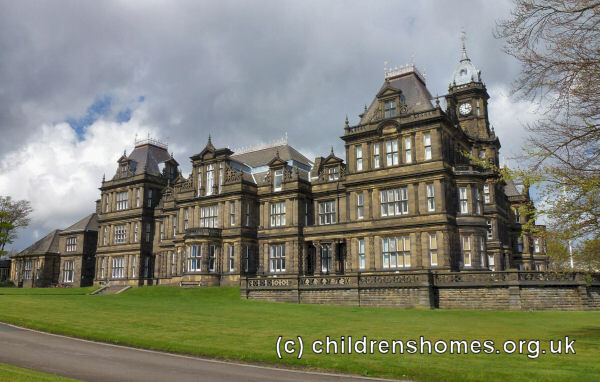 Building of the institution began in the same year at an eight-acre site on Free School Lane, Halifax, named after the Heath Grammar School founded in 1600. Part way through the construction work, however, the brothers decided that the establishment should instead became an 'Orphan Home and School' which would lodge, board, clothe, educate and apprentice children who had either lost both parents or just their father. The building took more than six years to complete but, at last, in June 1864, an initial group of six orphan boys arrived. The honour of being the first to be admitted went to a boy named James Labron Plint. The building, a blend of Jacobean and Italianate styles, was designed by local architect John Hogg and cost in the region of £56,000 — an enormous sum at that time. As well as the cost of construction, the brothers provided an annual endowment of £3,000 towards the running of the home which was planned to house up to 400. Those admitted to the institution were expected to contribute a payment of between £5 and £10 a year, except for forty who costs were met from the endowment which was also supplemented by public donations and subscriptions. In the home's early years, children were admitted from the age of six, with boys remaining until the age of 15 and girls until 17. In the 1880s, around twenty per cent of the children came from the Halifax area, the rest from across the country. Visiting was allowed on the first Tuesday of each month for a maximum of two hours, later increased to three. As well as basic education in reading, writing, arithmetic and bible study, all the children were taught geography, drawing, basic natural science and singing. The more able boys also could also study Latin, a modern language, algebra and geometry. The girls' education, in the early days, at least emphasised needlework and other domestic skills. Following the 1870 Education Act, official inspections of the school led to a raising of academic standards, with children taking Cambridge Local examinations from 1876. The following year, the girls were given their own headmistress for whom a two-storey extension was built in around 1883. The institution's main building included dormitories, classrooms, and dining and washing facilities. To the rear were separate boys' and girls' playrooms and swimming baths, and various ancillary buildings such as the laundry. The girls occupied the south-west portion of the building, with the boys in the north-east half. By the mid-1880s, the number of orphans at the home was around 220 even though it could by then house 500 children. In 1887, £50,000 endowment was made by Manchester yarn merchant, Thomas Porter, provided that the establishment was renamed as the Crossley and Porter Orphan Home and Schools. Porter's donation allowed more places to be subsidised and so boost numbers at the home. Some of the money was also used to acquire extra land at the south-west of the building and to erect a nearby sanatorium known as Horsfall House. The location of the institution is shown on the 1933 map below. 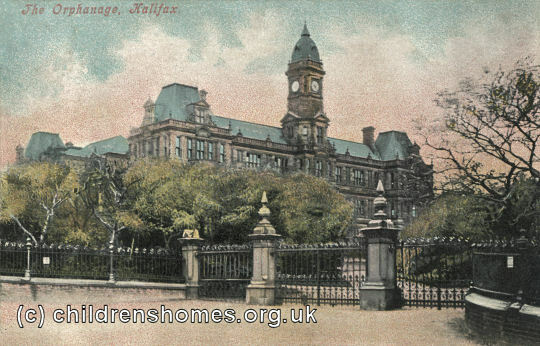 Crossley and Porter Orphanage site, Halifax, c.1933. Following the 1918 Education Act, the Schools became grant-aided and received some funding from locals councils who then had representatives on its governing body. The institution now became officially known as 'The Crossley and Porter Schools, Halifax'. Despite this additional funding, the Schools' declining numbers — just over 100 in residence by 1925 — led to increasing financial difficulties. Fees for boarders were raised to £40 a year and paying day-pupils were admitted for the first time. In 1923, a four-day diamond jubilee festival was held to clear the deficit which then stood at more than £16,000. This event, together with the sale of the sanatorium, and a donation of £10,000 by Mr John William Standeven, brought the schools back into the black and also allowed a reduction in boarders' fees. In October, 1924, it was reported that the Halifax Society for the Blind had purchased the sanatorium building for conversion into hostel for the blind. A workshop for the blind was also to be added. The Schools flourished during the 1930s, with new wings being added to the building, the establishment of a sixth form. During the Second World War, the Schools lost many of the male staff to the armed forces, and boarders were evacuated to live with families in the area. The upper two floors of the building were taken over as a hostel for students from the Whitelands teacher training college. Under the 1944 Education Act, the Schools took on 'voluntary controlled secondary (grammar)' status, with the abolition of school fees and an end to boarding in the main school building. In 1985, against a background of falling numbers and rising costs, the Crossley and Porter School was merged with the nearby Heath School to form the Crossley Heath School. Although the sanatorium was demolished in around 2002, the other buildings still stand. 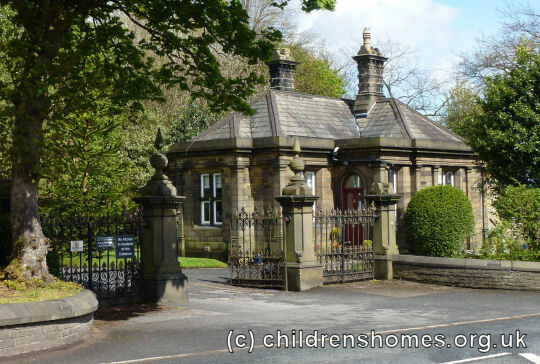 Crossley Heath School has an extensive archive containing original journal lists of orphan names and their numbers, and thousands of orphan/student photographs. For specific enquiries or to request access, please contact the school. West Yorkshire Archive Service - Calderdale, Central Library, Northgate House, Northgate, Halifax HX1 1UN. A mixed bag of holdings include plans of the building, school magazines, Boy Scout and Girl Guide related material, items relating to James Labron Plint, and memories of Bertha Anita Whiteley — a former inmate (1889-91).